My biggest news is that I was shortlisted for The Rialto/Poetry School Poetry Editor Development Programme but I wasn’t successful. In a case of unfortunate timing, the interviews were scheduled to take place bang in the middle of my family holiday in western France so my ‘meeting’ with Michael Mackmin (Editor at The Rialto) and Ollie Dawson (Director at The Poetry School) took place via mobile phone from our rented house in Crozon, Brittany. I might have done better if I’d been able to prepare with less distractions (I found out I’d been shortlisted the day before we caught the Plymouth to Roscoff ferry) and I might have given a more glittering account of myself in a face-to-face interview but it was always going to be a long shot, given the stiff competition for places on this exciting programme. It’s nice to know that my CV and personal statement impressed them enough to want to interview me, I guess. C’est la vie! It wasn’t to be and I did feel upset for a few days when I found out I’d failed and so missed the opportunity to co-edit one section of the Spring 2014 edition of The Rialto. However, I’m delighted that one of the two people selected is Fiona Moore whose recent pamphlet The Only Reason for Time is wonderful (I even mentioned it in my interview with Michael and Ollie when they asked me what I was reading!) and who writes a brilliant blog here. I wish Fiona and the other successful candidate Abigail Parry (whose work I will now investigate – I’ve heard good things!) the very best. And I’m so pleased that there will be two more women poetry editors on the scene. I’ve discovered Tumblr (I’m sorry WordPress! I still love you but I’ve made myself a Shed of Solitude and I’ve been sticking up pictures and videos and poems). It’s fun. I’ve recently discovered a beautifully made and very good online magazine called B O D Y that I’d like to send something to. If you don’t know it, take a look. That’s it for now. I keep meaning to blog more regularly but I can’t seem to keep to a strict schedule. 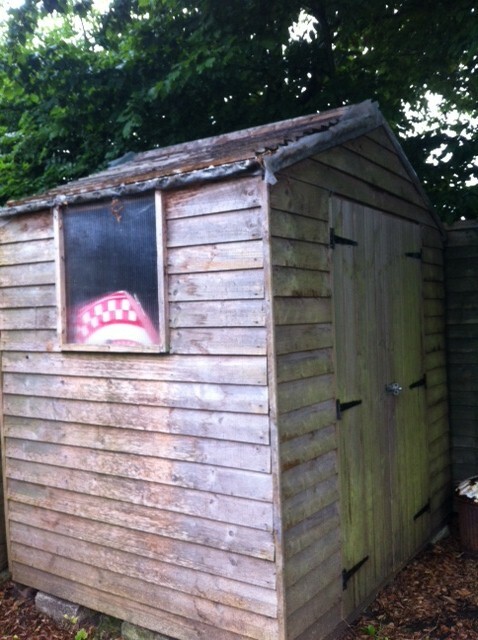 If I’m not here, you could always come to look for me in my shed…. Congratulations Josephine, this is great news. You must feel encouraged. Remember how far you got. Next time…. Congratulations on making the shortlist, Josephine. I didn’t even get that far and was disappointed too. You would have been very good. Loving your blog. Josephine, wow well done to you for getting shortlised. You have made such a positive impact on the poetry world. Good things will come of this! PS let me know what you think of Tumblr, I had a Tumblr blog a while back but let it languish, I couldn’t get into the whole ‘notes’ thing. I don’t think I was ever that close, Robin!! I knew when I applied when the interview date was – but our holiday was long booked. I just thought I’d go for it, not expecting to make the shortlist. I’m grateful, now, for the experience and I’m pleased for Fiona (who I’ve corresponded with via email and who is a fantastic choice) and Abigail. Tumblr is my little patch of fun at the moment – I enjoy its simplicity and the way I can easily collect different post formats in one place. I’ll still keep WordPress for longer posts. I would be interested in finding your Tumblr…. I’m just going to copy everyone else and congratulate you on being shortlisted: that is a terrific achievement. I’m sure your skills will be snapped up by someone before long. I’ll have a look at your Tumblr soon. Bit nervous of stepping somewhere new. I gave up Facebook ages ago and have been exclusively Twittering since then. Same as above, big congratulations on being shortlisted! Envious of your shed, I’ve always wanted a shed to hide away in…hubby says I’m too much of a bloke, lol!